Soorma and Ant-Man and the Wasp registered an average of 20 and 25 percent occupancy on the first day, while Ranbir Kapoor's Sanju witnessed 30 percent footfalls on its third Friday. 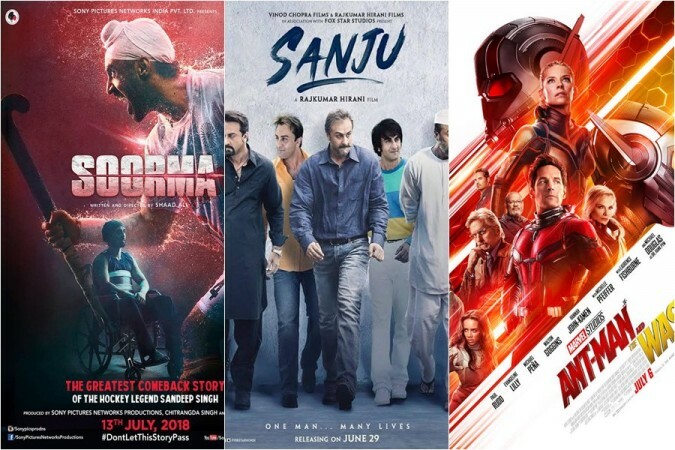 Soorma and Ant-Man and the Wasp opened to an average response at the Indian box office in the morning shows of their first day, while Sanju continued to make a good collection on its third Friday. Soorma starring Diljit Dosanjh and Taapsee Pannu is a biopic on the life of international hockey play Sandeep Singh and its promos created curiosity among filmgoers. The makers released the movie in 1,100 screens across the domestic market. On the other hand, Ant-Man and the Wasp has been released in four Indian languages in 1,300+ screens. Both the new releases forced Sanju out of almost 50 percent cinema halls that it was holding for the last two weeks. After seeing their hype and promotion, the trade analysts predicted that they would also become the first choice for many viewers across the country and take a toll on its collection in its third week. Both the new movies were expected to start on a good note, but they received an average response in the morning shows on their opening day. Soorma and Ant-Man and the Wasp registered an average of 20 and 25 percent occupancy, respectively. However, both of them have got a positive talk. A strong word of mouth is expected to boost their collection in afternoon and evening shows. On the other hand, Sanju is undeterred by the new releases as it has continued to woo filmgoers in the third week too. The movie might have lost some cinema halls for them, but its occupancy in the existing number of screens is much bigger than that of the new films. The film registered 30 percent occupancy in the morning show on its third Friday and it will go up in the later shows. The early trends show that Sanju would make better collection than Soorma and Ant-Man and the Wasp at the box office this Friday and continue to lead the race at the ticket counters.